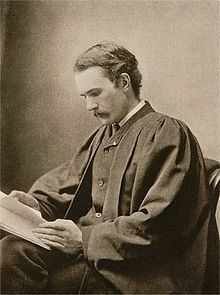 George Gilbert Aimé Murray, OM, FBA (2 January 1866 – 20 May 1957) was an Australian-born British classical scholar and public intellectual, with connections in many spheres. He was an outstanding scholar of the language and culture of Ancient Greece, perhaps the leading authority in the first half of the twentieth century. He is the basis for the character of Adolphus Cusins in his friend George Bernard Shaw's play Major Barbara, and also appears as the chorus figure in Tony Harrison's play Fram. ...if we lay at all too much stress on the need of warlike preparations for quelling the peace-breaker, we find ourselves on a very slippery slope. ... It is all a perpetuation of war, not a planting of peace: a hardening in old error, not a change of heart. One of the most advanced French advocates of the League once said to me that the true guarantee of peace in Europe was a strong French Army and a strong British Navy. The sort of man who thinks that is the sort of man who ought never to be allowed to touch international affairs. Remove that implication. Accept freely, and put into practice, the principles of genuine and equal Disarmament, and then your preparation for Sanctions is perfectly right. To put crushing Sanctions in the hands of two particular Powers, or of an alliance of certain highly armed Powers, would be a crime against humanity. The real difficulty of the situation lies in the practical working of the coercion. Let it be laid down that the League as a whole will take the necessary action, economic or military. Well and good; but the League is not a military or economic unit and possesses no central executive. It is a society of independent sovereign states, their independence somewhat modified by treaty obligations and a habit of regular conference, but none the less real. I doubt whether the League as a League could declare war or wage war. The force would have to be supplied by each state separately, of its own deliberate will. ... One cannot expect Siam or Canada to mobilize because one Balkan state attacks another. And if the duty is not incumbent on all members, who is to decide what members are to undertake it? The Council has no absolute authority. No nation will be eager to subject itself to the strain and sacrifice of coercive action unless its own interests are sharply involved. But the question is whether, in a world that increasingly detests war and mistrusts force as a instrument of international policy, the various national Parliaments or Governments will in general have sufficient loyalty to the League, sufficient public spirit and sense of reality, to be ready to face the prospects of war not in defence of their own frontiers or immediate national interests, but simply to maintain the peace of the world. It is hard on many people, on naval and military circles, on Philistine newspapers, on smart society in London, just as it is hard on similar circles in Berlin, to have to give up their favourite dreams and admit themselves definitely defeated, defeated even in the Tory Cabinet, by dull middle-class pacifism. ... all parties are pledged to the League...all Prime Ministers and ex-Prime Ministers support it...no candidate for Parliament dares to oppose it openly. In sum it seems to me that the Covenant, though not without certain ambiguities and loop-holes, is on the whole a wonderfully successful instrument, flexible, comprehensive, and exactly directed to the main evil which it was desired to cure. It does aim straight at the heart of the international anarchy; and it does so by a method which is calculated to stir up the very minimum of opposition. Its normal sanction is the public opinion of the world; its most effective weapon publicity. You cannot punish a nation; you cannot even coerce by force any moderately strong nation. But you can exert a very severe pressure on even the strongest to mend its ways by simply putting a question to its representative at the Assembly, or at one of the permanent Commissions, and publishing its reply.